In particular, this is a square 2D palindrome, which is when a square text admits four symmetries: identity, two diagonal reflections, and 180 degree rotation. As can be seen, the text may be read top-to-bottom, bottom-to-top, left-to-right, or right-to-left; and it may be rotated 180 degrees and still be read in all those ways. The Sator Square is the earliest dateable 2D palindrome. It was found in the ruins of Pompeii, at Herculaneum, a city buried in the ash of Mount Vesuvius in 79 AD. It consists of a sentence written in Latin: "Sator Arepo Tenet Opera Rotas." Its translation has been the subject of speculation with no clear consensus; see below for details. Other 2D Palindrome examples may be found carved on stone tablets or pressed into clay before being fired. One likely translation is "The farmer Arepo has [as] works wheels [a plough]"; that is, the farmer uses his plough as his form of work. Though not a significant sentence, it is grammatical; it can be read up and down, backwards and forwards. C. W. Ceram also reads the square boustrophedon (in alternating directions). But since word order is very free in Latin, the translation is the same. 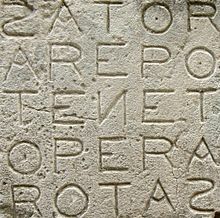 If the Sator Square is read boustrophedon, in reverse direction, the words become SATOR OPERA TENET, with the sequence reversed. The word arepo is a hapax legomenon, appearing nowhere else in Latin literature. Its similarity with arrepo, from ad repo, 'I creep towards', may be coincidental. Most of those who have studied the Sator Square agree that it is a proper name, either an adaptation of a non-Latin word or most likely a name invented specifically for this sentence. Jerome Carcopino thought that it came from a Celtic, specifically Gaulish, word for plough. David Daube argued that it represented a Hebrew or Aramaic rendition of the Greek Αλφα ω, or "Alpha-Omega" (cf. Revelation 1:8) by early Christians. J. Gwyn Griffiths contended that it came, via Alexandria, from the attested Egyptian name Ḥr-Ḥp, which he took to mean "the face of Apis". An origin in Graeco-Roman Egypt was also advocated by Miroslav Marcovich, who maintains that Arepo is a Latinized abbreviation of Harpocrates, god of the rising sun, in some places called Γεωργός `Aρπον, which Marcovich suggests corresponds to Sator Arepo. If arepo is taken to be in the second declension, the -o ending could put the word in the ablative case, giving it a meaning of "by means of [arepus]." Using this definition of arepo and the boustrophedon reading order produces the text "The sower works for mastery by turning the wheel." The oldest datable representation of the Sator Square was found in the ruins of Pompeii. Others have been found in excavations under the church of S. Maria Maggiore in Rome, at Corinium (modern Cirencester in England) and Dura-Europos (in modern Syria). 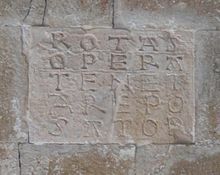 The Benedictine Abbey of St Peter ad Oratorium, near Capestrano, in Abruzzo, Italy, has a marble square inscription of the Sator Square. An example discovered at the Valvisciolo Abbey, also in central Italy, has the letters forming five concentric rings, each one divided into five sectors. Other Sator Squares are on the exterior wall of the Duomo of Siena, Italy, and on a memorial. 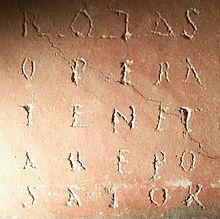 Outside of Italy, an example found in a group of stones in the grounds of Rivington Church reads SATOR AREPO TENET OPERA ROTAS. The stone is one of a group thought to have come from a local private chapel in Anderton, Lancashire. An example is found inserted in a wall of the old district of Oppède, in France's Luberon. There is a Sator Square in the museum at Conimbriga (near Coimbra in Portugal), excavated on the site. There is one known occurrence of the phrase on the rune stone Nä Fv1979;234 from Närke, Sweden, dated to the 14th century. 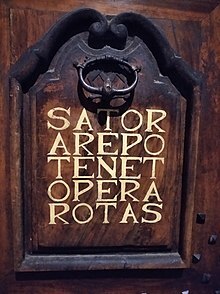 It reads "sator arepo tenet" (untranscribed: "sator ¶ ar(æ)po ¶ tænæt). It also occurs in two inscriptions from Gotland (G 145 M and G 149 M), in both of which the whole palindrome is written. "Sator Square" appears as a geographical location in the city/state of Anhk-Morpork in Terry Pratchett's Discworld series of books. 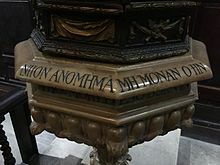 By repositioning the letters around the central letter Ν (en), a Greek cross can be made that reads Pater Noster (Latin for "Our Father", the first two words of the "Lord's Prayer") both vertically and horizontally. The remaining letters – two each of A and O – can be taken to represent the concept of Alpha and Omega, a reference in Christianity to the omnipresence of God. Thus the square might have been used as a covert symbol for early Christians to express their presence to each other. An example of the Sator Square found in Manchester dating to the 2nd century AD has been interpreted according to this model as one of the earliest pieces of evidence of Christianity in Britain. The Coptic Prayer of the Virgin in Bartos describes how that Christ was crucified with five nails, which were named Sator, Arepo, Tenet, Opera and Rotas. This reading of the words consequently entered the Ethiopic tradition where they became as the names of the wounds of Christ. In Cappadocia, in the time of Constantine VII Porphyrogenitus (913–959), the shepherds of the Nativity story are called SATOR, AREPON, and TENETON, while a Byzantine bible of an earlier period conjures out of the square the baptismal names of the three Magi, ATOR, SATOR, and PERATORAS. Other authorities believe the Sator Square was Mithraic or Jewish in origin, because it is not likely that Pompeii had a large Christian population in 79 AD and the symbolism inferred as Christian and the use of Latin in Christianity is not attested until later. The Sator Square is a four-times palindrome, and some people have attributed magical properties to it, considering it one of the broadest magical formulas in the West. An article on the square from The Saint Louis Medical and Surgical Journal, vol. 76, reports that palindromes were viewed as being immune to tampering by the devil, who would become confused by the repetition of the letters, and hence their popularity in magical use. The same principle, alongside the above "Paternoster cross", is also present in the Greek magical palindrome: ΑΒΛΑΝΑΘΑΝΑΛΒΑ, which probably derives from the Hebrew or Aramaic אב לן את, meaning "Thou art our father". The square has reportedly been used in folk magic for various purposes, including putting out fires (the spell is "TO EXTINGUISH FIRE WITHOUT WATER" in John George Hohman's Long Lost Friend), removing jinxes and fevers, to protect cattle from witchcraft, and against fatigue when traveling. It is sometimes claimed it must be written upon a certain material, or else with a certain type of ink to achieve its magical effect. ^ Ceram (1958), p. 30. ^ "'Arepo' in the Magic 'Sator' Square'": J. Gwyn Griffiths, The Classical Review, New Series, Vol. 21, No. 1, March 1971, pp. 6–8. ^ Magi, Filippo (1972). Il calendario dipinto sotto S. Maria Maggiore. Libreria Editrice Vaticana. ISBN 9788820943790. ^ John Rawlinson, About Rivington, Chorley: Nelson Brothers Limited, 1969, p. 42. ^ a b "Samnordisk runtextdatabas". Runforum Uppsala. 2010-12-20. Archived from the original on 2012-05-25. Retrieved 2014-02-13. ^ Robert Milburn; Robert Leslie Pollington Milburn (1988). Early Christian art and architecture. University of California Press. pp. 1–. ISBN 978-0-520-06326-6. Retrieved 22 December 2011. ^ James De Quincey Donehoo (1903). The Apocryphal and legendary life of Christ: being the whole body of the Apocryphal gospels and other extra canonical literature which pretends to tell of the life and words of Jesus Christ, including much matter which has not before appeared in English. In continuous narrative form, with notes, Scriptural references, prolegomena, and indices. Macmillan. pp. 350–. Retrieved 22 December 2011. ^ Ludolf, Hiob (1691). Iobi Ludolfi alias Lutholf dicti ad suam historiam Adthiopicam adhanc editam commentarius. p. 351. Retrieved 8 September 2017. ^ Ferguson, Everett (1 September 2003). Backgrounds of early Christianity. Wm. B. Eerdmans Publishing. pp. 590–. ISBN 978-0-8028-2221-5. Retrieved 22 December 2011. ^ The Gentleman's Magazine vol. 258, 1885. Shotter, David (1993). Romans and Britons in North-West England. Lancaster: Centre for North-West Regional Studies. ISBN 1-86220-152-8. Ceram, C. W. (1958). The March of Archaeology. New York: Alfred A. Knopf. L.C.Catalog no. 58-10977. Wikimedia Commons has media related to Sator Arepo Tenet Opera Rotas. Pérez-Rubín, Carlos (2004). "The sunken ruins of Pompeii and an age-old enigmatic specimen of roman incidental Epigraphy" (PDF). Documenta & Instrumenta. 2: 173–192. "Section of Page and Eloise's Memorial website related to the Sator Square, 1995 (HTML)"
This page was last edited on 14 April 2019, at 17:37 (UTC).